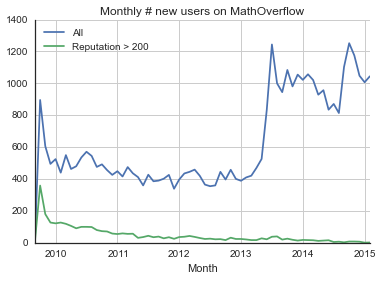 I am playing with the Stack Exchange Data Explorer to compare some MathOverflow stats to arXiv stats. 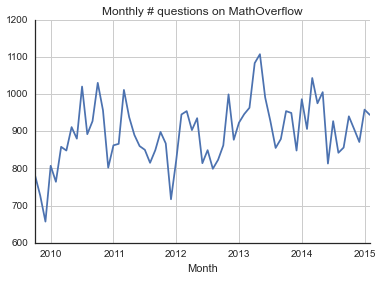 I was surprised to see, that in the last 4 years there was almost constant activity (measured by the number of questions). There is constant influx of new users (with a sharp step after joining the Stack Exchange network), but not many get a non-trivial reputation. If the data is complete, is it a sign on stagnation (i.e. we should worry, as it losses its impact OR it could reach a wider pool of people) or just saturation? For the number of answers it looks even more worrying (it went down from 3.5 to 1.0 per question). There is a delay between creating an account and gathering 200 reputation. So, maybe some more advanced statistics (like the typical "lifespan" of a user) would help. (If anyone thinks this would be better as a "comment", please move it...) This issue is something I've thought/worried about for some years. The most poignant "unhelpful" mechanism is that very-competent people can find "old" answers to questions related to their immediate question, and, thus, not ask a question. Meanwhile, relative-incompetents will not think of this, and/or will not succeed in doing it, and, thus, inevitably, ask the same old (and, necessarily, naive) questions. The delicate issue in talking about more-or-less serious/research-level mathematics is that there is no trivial algorithm to distinguish "elementary" from "serious", so far as I know. Operationally, that essentially means that a person might feel obliged to look at many things ... that will prove to be silly/etc. But, yes, after accumulating a corpus of apt answers to the (!) iconic questions, what next? To my mind, the issue is about how to keep the site "lively", rather than as an archive of good answers to all the usual questions. It's less fun to look at a site that is just a log of redirections to archives. Um, but, ... ?! ?